Do you work with children and families and want to enhance their life and learning? The BrainChild Developmental Program can help you achieve that aim. BC LEVEL 1A – From conception to one year – providing the best environment for early development. BC LEVEL 1B.- The School Program – a program for groups and classes in early years settings and primary schools. BC LEVEL 1C – The One-to-one Program – a hands-on program to teach to parents to help their children. Understanding why children behave as they do. 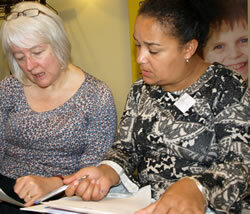 Professionals working in schools and nurseries as teachers and teaching assistants. Professionals working with children and families, in particular, children at risk, in foster care and adoptive families. Professionals who are interested in understanding the impact of early life experiences on the future functioning of the whole child – health visitors and paediatric therapists. This practical two day course provides professionals with the knowledge and skills to observe and assess children who may benefit from the Brainchild Developmental Program. The program is specifically designed to work on early brain development that is the foundation for a child’s ability to learn, in the widest sense of the word. Although the different versions of the program have a serious purpose, children experience it as imaginative, active and fun. The course is designed to provide an understanding of the effects of neuro-developmental delay. We will examine the relationship between infant reflex issues and behaviour and discuss the impact of very early experience on communication, focus and attention, social interaction and awareness, anxiety, fears and obsessions, aggression, hostility and impatience, learning, sensory integration, health and physical impact, bonding, happiness and self esteem. The developing brain in utero. The importance of the carer in the Primal period – conception to one year of age. The role of the infant reflexes. The physical action of each of the key reflexes. The impact of Neuro-Developmental Delay. The effect on learning and behaviours. The impact of stress and movement opportunities on the developing brain. The Developmental Process, including detailed information about the key reflexes. The relationship of infant reflexes and sensory integration. How The Brainchild Developmental Program can address Neuro-Developmental Delay by enabling maturation of the brain. A course manual including assessment materials and record sheets are provided. The next two day Foundation course: April 27th and 28th 2019. Lunches and refreshments provided. Having just completed the training program , I have to say it is possibly one of the best trainings I have ever been on…fabulous, fun, interesting, and most of all highly valuable to my work as a social worker with children with a complex range of needs. (Not to mention how well we were looked after by Viv !). It really is worth doing if you are a professional working with children who struggle with areas of development , and indeed if you are a parent/carer of a child with any difficulties. Thanks Viv and Brainchild, I’m very excited about the program and what this may offer to the children I work with !